It’s been a week since I experienced one of the most anticipated shows I’ve ever attended. There’s no denying that having the opportunity to assist in putting on these shows has been some of the most fun I’ve had in my life, and being able to help out is a major contributing factor to the level of excitement that builds up inside of me as the show date approaches. Despite my involvement, this show in particular is one that I and many others have been looking forward to for a long time. The lineup was such an enticing combination of performers that people came from as far as Texas to spend their Friday night at the Teragram Ballroom, filling their heads with the musical madness that these bands brought to the stage. Surf punk legends Beach Goons are a band that everyone looks forward to hearing, due to their interesting sound that appeals to any type of crowd. 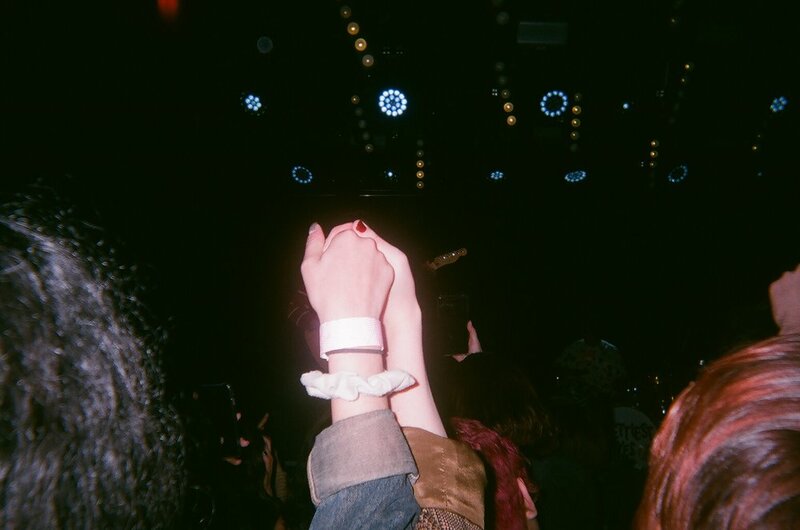 Of course there were people going crazy and starting a pit, but even the people chilling in the back were enjoying themselves just as much, if not even more than the audience members up at the front. With verses similar to those of The Frights and crazy choruses that can drive even the most reserved person in the room to mosh, Beach Goons truly rose to the occasion, despite being the first band to play. Usually I only go into the pit for my favorite songs, but with them I was able to stay almost the whole time. While I was working the merch table between sets, at least thirty people inquired about Beach Goons merchandise, and the only downside to the entire night was the fact that I had to tell so many people that we weren’t selling any of their stuff. The band played many songs off of their 2016 album, BoiSad, which sent the crowd into an excitement filled frenzy, and that’s including the people that weren’t even there for them. Jurassic Shark are masterminds at producing lo-fi music with an edge. They played a collection of songs ranging from fan favorites like the catchy song, “Summer,” to pieces from their latest EP release, Blue School, such as “Stepped Out.” Each song was embedded with feel-good melodies and guitar parts, reminding me somewhat of a more punk induced version of a Beach Fossils’ song. Although I have seen Jurassic Shark previously, I have only seen them play short, outdoor sets so getting to see them at a space like the Teragram was awesome, because I could hear them really well and got a good look at their crowd. The audience was acting a little bit more rambunctious than they were for the previous band, probably due to the fact that not one of Jurassic Shark’s songs isn’t infectious. I’ve never seen so many people crowd surf during one set as I did during their performance, and something I noticed that was especially cool was the fact that the crowd was accommodating. If someone fell, someone else picked them up. If someone didn’t want to be in the pit, no one pushed them in. Prettiest Eyes was a wild card for me. I had never seen them before and I knew that their music was pretty different from the other bands that were included in the lineup, so I was unsure how smoothly that would go over with the audience, but everyone seemed to really enjoy it. The fact that the drummer also sings lead vocals is intriguing, and the synth combined with such heavy bass is something that I haven’t taken well to in the past, but since this band delivered such a rowdy set, I didn’t mind it. Everyone was dancing to tracks such as “Don’t Call” and “Pools,” and the music was enough to make you feel like you’re high in the best way possible, so I definitely wasn’t complaining. No Parents headlined the show for a reason; they’re one of the wildest bands I’ve ever seen. The lead singer engaged in ridiculous choreography for each song, which made their humorous set even funnier. Everyone around me was either crowd surfing or dancing, and since this was the longest set they’ve ever played, they did all the classics, including “Hey Grandma,” “Monkey on my Back,” “Chix in L.A.,” as well as some songs from their newest EP, Still Thirsty, which is one of the most California punk sounding EPs I’ve heard in a long time. The fact that everyone there was screaming the words to the songs off of Still Thirsty caught me off guard, since it was put out so recently. In my experience, it usually takes around 6 months within releasing music for listeners to connect with it enough to really get excited during a live performance, but that was not the case. I swear when they started playing “Hunting in Huntington,” everyone bolted to the front, even the few people that had been standing around all night. The lead singer dove into the crowd at the end of the set, which only made the energy even higher, and the band’s ‘I don’t care about anything’ vibe eventually led to the audience chanting for an encore. Once the show was over, my friends and I stepped onto the streets of downtown L.A. drenched in sweat and out of breath from the show. Nothing compares to being able to see three bands you already know and love in such a small space, while getting the opportunity to check out a new one at the same time. The show was really refreshing, because so many shows I’ve been to lately have been low energy and this one was exactly the opposite. I am already anticipating the day I get to see these bands play again.